Stargate SG-1 is easily one of my all-time favorite TV series. The writers clearly have a load of fun and exhibit a significant amount of creativity and originality in their stories, hence their continued success beyond even Star Trek TNG's run of seven years. Impressive for any television series, but even more significant for the long-ignored genre of science fiction! One of the central characters through the first eight seasons was Richard Dean Anderson, who as Colonel Jack O'Neill, was able to consistently deliver that outstanding dead-pan cynical sense of humor. Of course I don't need to mention that the talent and beauty of Amanda Tapping and Teryl Rothery made these episodes far more enjoyable! While Stargate SG-1 has achieved its success with more emphasis on its character interactions, the series wouldn't be the epic thriller without alien worlds, alien technologies, and even a spacecraft or two. 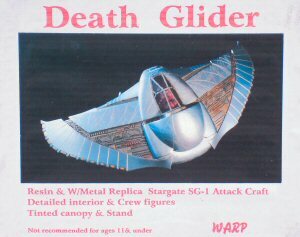 One of the first such craft was featured in the pilot movie 'Stargate' - the Death Glider. The Death Glider looks like a Klingon Bird of Prey shrunk down into a two-place craft. It's wings are bird-like in shape, but mechanical in detail. The bulbous fuselage houses the two-place cockpit and propulsion unit. 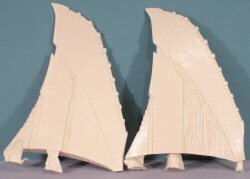 Scaled up versions of the Jaffa staff weapons are used as the main armament for these craft. I was wandering through the variety of 'cottage industry' products listed on the Federation Models online store when I spotted this kit - a 1/35 scale resin Death Glider. While I have not seen a Warp Models kit before, given the subject, I decided that this was a good time to try one out. What arrived was a simple box that contained a well-packaged kit. Inside were well-protected parts that include 13 resin and six white metal parts for the crew figures. The main fuselage 'bulb' is one big solid honking hunk of resin! The casting is excellent and the detail very nicely executed. The cockpit 'tub' visible in this picture receives a resin cockpit insert to provide the two-place cockpit detail. 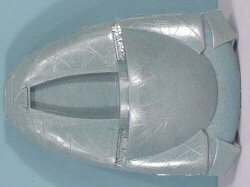 Due to the design of this kit, the cockpit is not full-depth, so what you have is just enough depth to provide the illusion of a full cockpit, but the two figures that sit inside are cast from the shoulders-up. Personally, I am going to stay happy with the partial depth for my build! The wings are VERY nicely detailed. The detail relief in the upper and lower surfaces of the wing (the wing on the left is the bottom view of the left wing whilst the one on the right is the upper surface of the right wing) is going to make for some awesome painting potential. Most of the Death Gliders seen in the various episodes over the years have been metallic in color, with the shades and metallic color combinations changing. This is an excellent time to become acquainted with Alclad II metalizer colors as this is an excellent candidate for that paint system. After admiring all of the well-packaged parts, I had two last packets at the bottom of the box - one containing the smaller resin and metal parts, and the other the canopy. When I opened the packet with the canopy, all of the parts came tumbling out - the canopy had shattered in transit. The good news is that I have one side and most of the windscreen intact, so scratchbuilding a replacement will be a no-brainer. Looking at the blue tint cast into this canopy, I would probably be scratchbuilding a new one anyway. 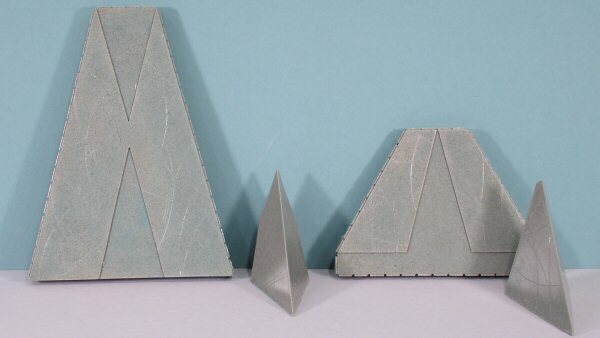 The kit also includes a nicely cast stand consisting of four parts. The instructions don't mention this stand and it will take a little experimentation to see how this stand is supposed to work. At $135.00, this might be a bit pricey at first, but when you see the quality of these castings in 1/35 scale, and you consider the lack of injection-molded models from the Stargate SG-1 series (there were a few figures released from the original movie that are LONG out of production), I am quite pleased to have this unique craft join my collection of spacecraft.